ALLEN PARK — Eight Lions — all of them starters — did not practice today (Wednesday) in preparation to face the Jaguars in Jacksonville on Sunday. Missing were wide receiver Calvin Johnson, who has a lingering knee injury; safety Louis Delmas, who re-injured his knee Sunday; running back Mikel Leshoure whose injury is known; Corey Williams (knee); DeAndre Levy, who missed Sunday’s game with a hamstring; cornerback Bill Bentley (shoulder); defensive end Cliff Avril (back) and Amari Spievey. Coach Jim Schwartz said on Monday that Spievey, who sustained a concussion at Chicago, still has to clear some hurdles. Cornerback Drayton Florence, who broke his arm on Sept. 16, returned to practice for the first time. He was placed on injured reserve-designated to return and will be eligible to play on Nov. 18 against the Packers. Wide receiver Mike Thomas, who was acquired in a deal with Jacksonville on Tuesday, was reportedly taking his physical during practice. The Lions didn’t wait until the Thursday trade deadline to make a move. On Tuesday they received veteran wide receiver Mike Thomas in a deal with the Jacksonville Jaguars. The Lions gave up draft picks in the deal. Thomas has 13 catches for 80 yards so far this season. 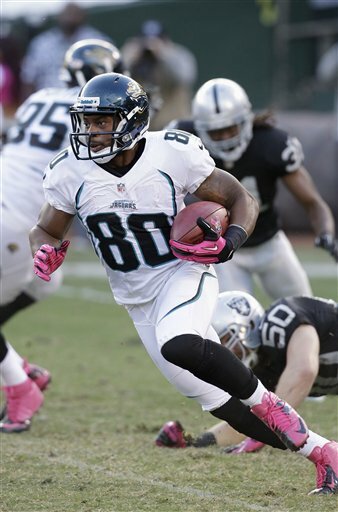 In his first three seasons with the Jaguars, he had 48, 66 and 44 receptions. Thomas returned punts for the Jaguars so it could be the Lions will look at him in that role. Coach Jim Schwartz likes multi-dimensional players. Lions wide receivers Titus Young and Ryan Broyles both stepped up in Sunday’s win over Seattle and it was assumed the pair would get more reps with Nate Burleson gone for the season with a broken leg. The Lions announced they released cornerback Justin Miller. They will not make the deal official until Thomas has passed his physical. Oddly enough, the Lions play at Jacksonville on Sunday. The NFL trade deadline was pushed back 48 hours until 4 p.m. on Thursday due to Superstorm Sandy. 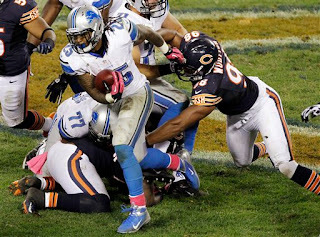 ALLEN PARK — Detroit Lions safety Louis Delmas, who has played in just three games this season, had tests done on Monday on his left knee. He injured it in the third quarter on Sunday and didn’t return to the game. It was the same knee he had surgery on Aug. 7. “(Delmas) had some tests today, he’s day to day, he’s sore,’’ coach Jim Schwartz said on Monday. “I don’t know if I’d classify it as a reinjury, it’s a sore knee that’s been bothering him through training camp and the season. “He’s a hard worker, a tough guy we’ll try to work through it,’’ Schwartz said at his Monday press conference. The knee has been a lingering problem for Delmas. Schwartz said the surgery was able to alleviate some of the pain. Schwartz had relatively good news on cornerbacks Jacob Lacey, who has missed two games with a concussion, and Drayton Florence who broke his arm in the game at San Francisco on Sept. 16. Both will return to the practice field this week. “We’ll see how he progresses from there,’’ Schwartz said of Lacey. Florence should be back at practice this week. “He’s moving around well and his arm is healed up, he’s not eligible to be back on the active roster for a couple of weeks,’’ Schwartz said. Florence had been placed on the injured reserve designated to return list, a new category this season. Safety Amari Spievey suffered a concussion at Chicago a week ago. In NFL news, the trade deadline has been pushed back from 4 p.m. Tuesday to 4 p.m. Thursday due to Hurricane Sandy. It’s not a lock, but there’s a chance the Lions could still make the playoffs. They are grinding through the tough part of the schedule and with a win at Jacksonville on Sunday they will be at .500. Nate Burleson, in a message from his hospital room, told the team that every comeback starts with a setback. 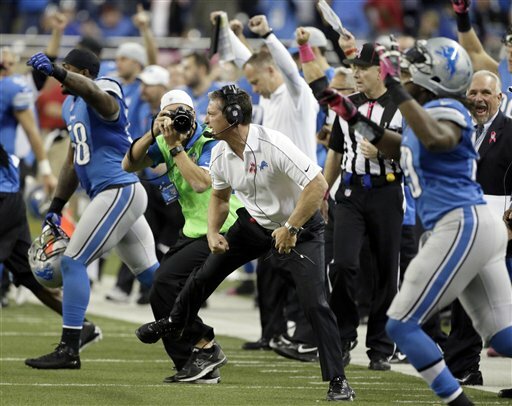 The setback was the loss at Chicago, perhaps the comeback started at Ford Field on Sunday. Here are five reasons the Lions have a chance at making the postseason for the second straight year. 1. Matthew Stafford is who we thought he was. Even with the tough start this season, teammates say he never hung his head, he just worked hard like he always does. To get down to basics, he has the arm and the smarts and along with that the respect of the team. 2. The defense played tough against the Seahawks but can play better. Due to injury it’s been a mix-and-match secondary week to week. Young guys like Jonte Green are getting much-needed experience. Safety Ricardo Silva, who was signed from the practice squad on Sept. 29, pulled in his first career interception. Silva was one of four defenseman to play every snap — Chris Houston, Stephen Tulloch and Justin Durant. 3. The Lions have found a successful running game using the combination of Mikel Leshoure (10 carries, 46 yards) and Joique Bell (seven for 25 yards). Leshoure start the game and they save Bell for later in the game when his legs are fresh and the defense’s legs are not. 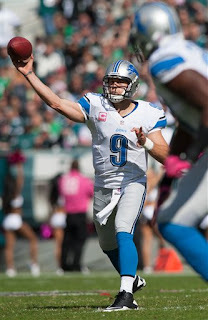 On Sunday the Lions finished with 331 passing yards and 84 rushing yards. They don’t look for 50-50 balance, they want the ratio that works on each particular Sunday. 4. Between Titus Young, Ryan Broyles and the tight ends, there are guys who can fill in for Nate Burleson. Oh, he’ll be missed, but Broyles will only improve with increased playing time. Young had a breakout game on Sunday that should boost the level of confidence that Stafford has in him. Tight ends Brandon Pettigrew (seven catches, 74 yards) and Tony Scheffler (four for 46 yards) had major contributions. 5. Look at the Giants last year. They finished the season 9-7. Can’t remember anyone who considered them the Super Bowl favorite and yet they won it. They were 6-6, riding a four-game losing streak, with just four games left and made it to 9-7. The gate is wide open this season. There is not one dominant team. DETROIT — Detroit Lions cornerback Bill Bentley (shoulder) was limited all week at practice and is inactive for today’s game against the Seattle Seahawks. Middle linebacker DeAndre Levy (hamstring is also out. Ashlee Palmer will start in his place. As expected CB Jacob Lacey and safety Amari Spievey, who both have concussions, are also inactive. Jonte Green will get his second straight start at cornerback while Ricardo Silva will start in place of Spievey. Other inactives — coaches decisions — are quarterback Kellen Moore and offensive tackles Jason Fox and Corey Hilliard. It’s not do-or-die, but it’s close. The Lions (2-4) are playing just their third home game of the season and need a win to stop the bleeding. 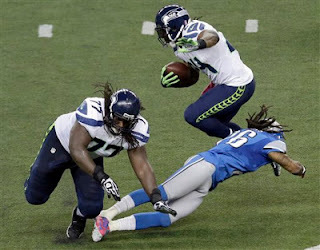 Here are five things the Lions must do to beat the Seattle Seahawks ( 4-3) on Sunday at Ford Field. 1. Defense must play as tough as they did against the Bears on Monday night. They can’t relax just because the Seahawks’ offense ranks 30th in the NFL. 3. Hang onto the ball. Hang onto the ball. Hang onto the ball. 4. Get the ball to Calvin Johnson. Matthew Stafford doesn’t care about statistics, just wins. That’s all good. But the more Johnson gets the ball usually the more wins the Lions will accumulate. Of course, Johnson can’t have a drop in the wide-open spaces either. 5. Be aggressive on offense from the get-go. Eagles quarterback Michael Vick tried to cure his fumble-itis before facing the Lions by every day carrying a football with him all day to lunch, to meetings and beyond. It didn’t work. The Lions are not taking that approach with Mikel Leshoure who has fumbled twice in recent games including a costly red zone cough-up on Monday night at Chicago. “We’re always talking about ‘Don’t take an inch for granted.’ But you can’t do it at the expense of ball security. He was a very ball-secure player in college. He’s been out for a while, whatever it was, a year out of contact,’’ Lions offensive coordinator Scott Linehan said. “You’ve got missing, really missing pretty much the entire training camp, except for maybe the last part of it. Those are the things that you take for granted and you find out and say ‘Hey, listen, we’ve got to make sure that we’re securing that ball,’ and both of our fumbles were extra-effort fumbles,’’ Linehan added. Running back Joique Bell also fumbled at the 1-yard line trying to go for the extra few inches on a second down. “You put the ball on the ground, it’s a self-inflicted wound and it takes points off the board and both of those fumbles were in scoring position, so never a good time, but it’s always pretty critical when you take away that opportunity,’’ Linehan said. “So, we’d like to pretty much get that off of our radar at this point. Last year we were a very good ball secure team, we didn’t have a lot of fumbles,’’ he added. Each of those fumbles prevented a possible game-winning touchdown. ALLEN PARK — Cornerback Bill Bentley, who injured his shoulder against Philadelphia, was back at practice today (Thursday) at least for the portion open to the media. Bentley had limited practice all last week, but did not play on Monday at Chicago. Calvin Johnson (knee) who wouldn’t have participated on Wednesday if the Lions practiced was on the field for the media portion. Missing from practice Thursday were Cliff Avril (back), DeAndre Levy (hamstring), along with Jacob Lacey and Amari Spievey who have concussions. Also, Lions cornerback Drayton Florence tweeted Thursday that he expects to be back at practice next week. He broke his right arm in the game against the 49ers and was placed on injured reserve with the ability to return. ALLEN PARK — Ndamukong Suh has set himself apart from other NFL players. The Detroit Lions defensive tackle has been rated the least-liked NFL player with just 19 percent of fans saying they like him in a new poll of NFL fans by Forbes magazine. 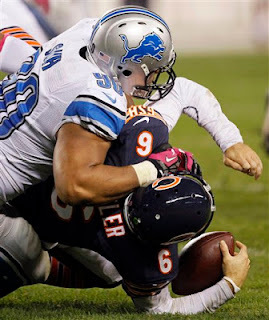 Suh is considered a dirty player by many. He didn’t help matters when he stomped on Green Bay’s Evan Dietrich-Smith last year in the Thanksgiving Day game. He was suspended two games without pay by the NFL. Leading up to that incident he had already been fined $42,500 by the NFL in less than two seasons in the league. When he came into the league, he said the NFL had never had a player like him. Suh, the second overall pick in 2010, had no comment on Wednesday about the negative tweets Bears wide receiver Brandon Marshall issued about Suh’s sack of quarterback Jay Cutler on Monday night. Cutler said he thought it was a clean hit. The poll was a collaboration between Nielsen and E-Poll Market Research to find out which NFL players fans liked and which ones they didn’t like. ALLEN PARK — Various reports have wide receiver Brian Robiskie signing with the Lions who lost Nate Burleson for the season after he broke his right leg on Monday night. The team has not confirmed the move. Robiskie, a second-round pick by the Cleveland Browns in 2009, has 39 career receptions for 441 yards. He was cut by the Browns on Nov. 1, 2011, and picked up by the Jacksonville Jaguars the next day. He was released by the Jaguars on Sept. 10. Robiskie, who is 6-foot-3 and 209 pounds, played college football at Ohio State. The Lions game wasn’t over when it was over Monday night. After the Lions 13-7 loss to the Bears, there was some action on Twitter. Bears wide receiver Brandon Marshall (@BMarshall) took to Twitter to express his displeasure about Ndamukong Suh’s takedown of quarterback Jay Cutler. Suh was not whistled for a roughing the passer penalty for the sack. Cutler’s right shoulder was ground into the turf. He went down in pain, the trainers came out and he went off the field. He took just one play off and was back. It was reported that he had bruised ribs. It’s possible the NFL could disagree with the on-field officials and slap Suh with a fine. Not only did the Detroit Lions’ record fall to 2-4 after a 13-7 loss to the Chicago Bears on Monday night, they lost at least one key player. Wide receiver Nate Burleson is done for the season after breaking his right leg when it appeared to lock when he made a reception. He was helped off the field by trainers, and then carted to the locker room late in the first half. It’s a huge loss for the Lions. Burleson has 27 catches for 240 yards in the first six games. He’s the only receiver who has at least two touchdowns. He’s in his 10th season but not slowing down. In 2011 he had a career-high 73 receptions. It’s not just the statistics, Burleson is very much a leader off the field. Calvin Johnson is the quiet sort, Burleson is the opposite. His leadership is key and it’s never the same when the player is sidelined. Also, safety Amari Spievey was carted off late in the second half. He had a head injury and was being tested for a concussion. The slow-to-start Detroit Lions, would like to see that change tonight when they play the Chicago Bears on Monday Night Football. If ever there’s a stadium not conducive to comeback wins for the opponent, it’s Soldier Field. Last year the Lions fell behind early — they were down 20-6 at the half — and never caught up, losing 37-13. This season they just have not been able to score touchdowns in the first half. The offense moved the ball, then has to settle for field goals. “We’ve scored, we’ve just been scoring threes, just trying to get sevens on the board that’s obviously important,’’ quarterback Matthew Stafford said. “I’ll take our opening drives just one play here, one play there we get seven instead of three changes some things. The Lions have scored 73 points in the fourth quarter and 50 in the first three quarters combined. It’s one reason why they are 2-3. In Philadelphia last week it was like Stafford found his inner Superman in the fourth quarter. Ron Jaworski, an ESPN analyst, said that in the first three quarters Stafford looked like he couldn’t hit water if he jumped out of a boat and in the fourth quarter played like Joe Montana. “Obviously I want to play like Joe Montana all four quarters, just doing whatever it takes to win, that’s what I’m all about,’’ Stafford said. Offensive coordinator Scott Linehan certainly is trying to find ways to score touchdowns early. All the Lions — coaches and players — know one thing. It doesn’t matter when the points are scored. It’s a huge game in the NFC North. Here are five things the Lions (2-3) need to do to beat the Chicago Bears (4-1) at Soldier Field on Monday Night Football. 1. Don’t turn the ball over. The Bears’ defense has scored five touchdowns off opponents turnovers. The forecast is for rain which could make the ball slick, but it will be the same for both teams. Matthew Stafford threw four interceptions last year due to a broken finger and major wind gusts. 2. Score touchdowns early. The Lions’ offense has actually moved the ball well early in games, it just doesn’t seem like it because they’ve mostly had to settle for field goals instead of touchdowns. They have just one first-half touchdown in five games. 3. Detroit’s defensive line must get after quarterback Jay Cutler early and often. The Bears’ offensive line is usually a weak area and the Lions have to take advantage. This is key because with two injured cornerbacks (Jacob Lacey is out and Bill Bentley is doubtful) rookie Jonte Green is expected to get his first start. 4. The run game must continue to play well. At the Eagles last week, the Lions had 138 rushing yards which helped open up the passing game. Mikel Leshoure had 70 yards (4.7 yards per carry) and looked as good as he did in his debut when he hit the 100-yard mark on the nose. 5. 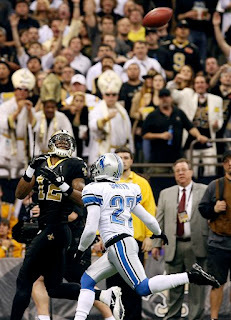 Get the ball to Calvin Johnson, perhaps in the first half. It’s not like Matthew Stafford is not trying, but he has to take what defenses give him. Charles Tillman is not going to make this task easier. Johnson and Stafford have not connected for a touchdown in the first five games. Last year at this point they had nine. ALLEN PARK — Defensive tackle Corey Williams, who practiced Thursday and Friday, did not participate today (Saturday). Williams had knee surgery on Sept. 25 and it’s uncertain if he’ll play on Monday night at Chicago. Also, cornerback Jacob Lacey did not practice. He hasn’t participated all week after sustaining a concussion on Sunday in Philadelphia. Cornerback Bill Bentley, who injured his shoulder at Philadelphia, was back at practice Saturday for the portion open to the media. He was limited on Friday. This will be the first time the Lions have played on Monday Night Football at Soldier Field. 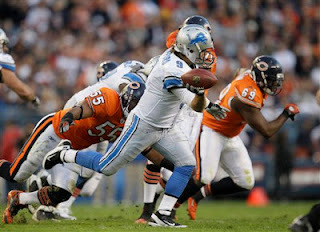 Last year the Lions boosted their record to 5-0 with a Monday night win at Ford Field over the Bears. The two NFC North teams are meeting for the 165th time overall with the Bears holding a 94-65-5 edge. The Bears have also won seven of the last eight meetings with the Lions. ALLEN PARK — Rookie cornerback Bill Bentley returned to practice today (Friday) for the first time since injuring his shoulder in Sunday’s win over the Eagles. He was on the field in a limited role during the portion of practice open to the media. This does not mean he will be ready to play on Monday night in Chicago, but it’s a step in the right direction. This is the healthiest the Lions have been in a while. The only player absent was cornerback Jacob Lacey who sustained a concussion on Sunday. It’s possible the Lions will start rookie Jonte Green at right cornerback alongside Chris Houston. It would be Green’s first NFL start. Alphonso Smith, who was brought back on Thursday, could start at nickel back. Safety Amari Spievey can also play nickel. Kyle Vanden Bosch and Louis Delmas rested on Thursday and were back at practice Friday. ALLEN PARK — Corey Williams, who had knee surgery on Sept. 25, returned to practice for the first time today (Thursday). If the veteran defensive tackle doesn’t have a setback, it’s possible he could play on Monday night at Chicago. Also, cornerback Alphonso Smith was at practice after signing with the Lions. He’s wearing No. 27, his old number. Cliff Avril, DeAndre Levy and Nate Burleson, who all missed Wednesday’s practice, were back in action in the portion of practice open to the media. Missing were Kyle Vanden Bosch (rest day) and Louis Delmas (possible rest day). Also out were cornerbacks Jacob Lacey (concussion) and Bill Bentley (shoulder). Both were injured in Sunday’s game. ALLEN PARK — Alphonso Smith, who played the last two seasons for the Lions, is back in the fold. The Lions announced this morning that they have signed the cornerback. To make room on the roster, they released running back Keiland Williams. Smith could be a short-term solution. He was in for a workout on Wednesday. The Lions are down to two healthy cornerbacks in Chris Houston and rookie Jonte Green. Amari Spievey, a safety who used to be a corner, can fill in at nickel. Cornerbacks Jacob Lacey (concussion) and rookie Bill Bentley (shoulder) were injured in Sunday’s game. Bentley said on Wednesday he wasn’t sure when he would be ready to play. With a concussion, there’s no timetable for Lacey. Neither one practiced on Wednesday. Smith played in a dozen games last season and started one. He had three interceptions and returned one for a touchdown. It’s a bit of surprise that Williams, who also plays special teams, would be the running back released. He played in half the special teams snaps and had one carry for one yard against the Eagles. At Philadelphia, veteran running back Kevin Smith, who does not play special teams, was inactive. ALLEN PARK — With two cornerbacks injured in Sunday’s win at Philadelphia, the Lions are looking for help at the position. Former Detroit Lions cornerbacks Alphonso Smith and Justin Miller were in for workouts on Wednesday morning. They left the facility about 1:15 p.m. Both were released in the final round of cuts after training camp on Aug. 31. He admitted it was a little odd working out for the Lions, a team he was with for two seasons (2010 and 2011). “Borderline uncomfortable,’’ Smith said. He did have a workout with the Miami Dolphins. “That went well,’’ Smith said with a smile. Smith played in a dozen games for the Lions last season with one start. He finished with three interceptions with one returned for a touchdown. In Sunday’s win at Philadelphia, cornerback Jacob Lacey left the game with a concussion while rookie Bill Bentley was knocked out with a shoulder injury. Coach Jim Schwartz didn’t offer any specifics on either injury in his press conference on Monday.